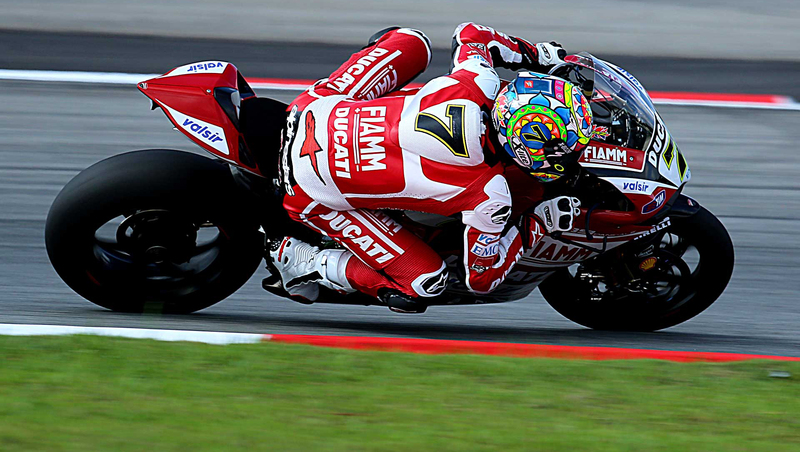 Motogear | Aragon SBK: An astonishing double win for Chaz Davies! Aragon SBK: An astonishing double win for Chaz Davies! 06 Apr Aragon SBK: An astonishing double win for Chaz Davies! On the obliging race track of Aragon, Chaz Davies scored a historic double triumph, winning both the race held on Saturday, and the following on Sunday (700th Superbike race). A determined Chaz took full advantage of both the technical innovations introduced on his Ducati, and the accommodating curves of a circuit that he prefers most- a superiority that in both races was absolute. With this double victory, Davies moves into second place in the overall standings of the championship and has begun to apply pressure onto the green and seemingly unbeatable, Kawasaki. Good race also for the more concrete Xavi Forés, who finished 4th in both races. Lorenzo Salvador is increasing in confidence in this category after scoring tenth and eleventh. Also, a great satifaction in Superstock 1000 where Tati Mercado and Michael Ruben Rinaldi scored first and second place in the starting race of the season.